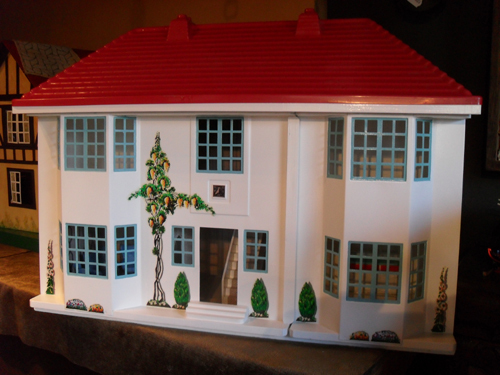 The house is now ready for decorating. I started with the hall and the lounge. 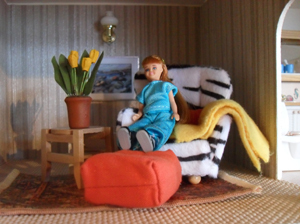 The carpet is textured wallpaper, which I have also used on the stairs.The house has now been given a good coat of white spray paint, and the window frames painted with a blue paint. 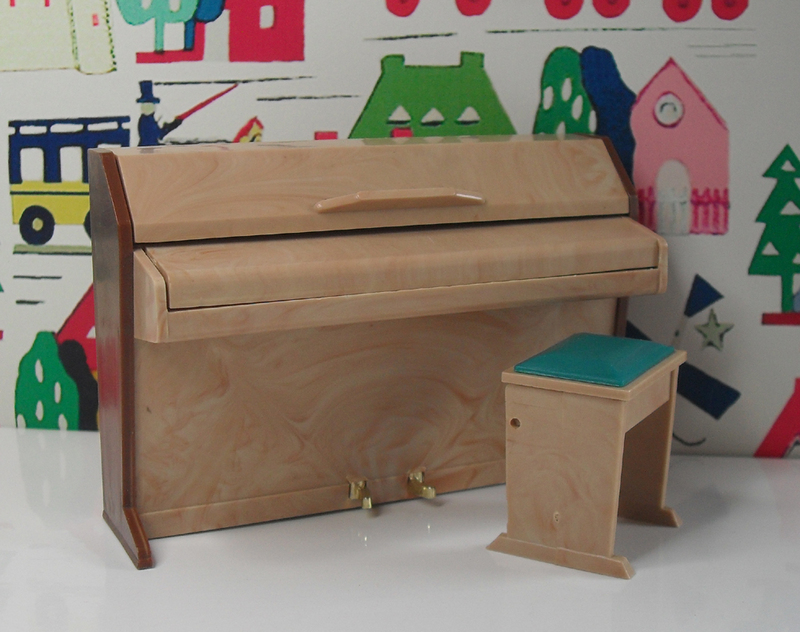 The whole front was then sprayed with clear lacquer. I have also added new stickers. All that needs to be done now is the door frame, and the lights connected. 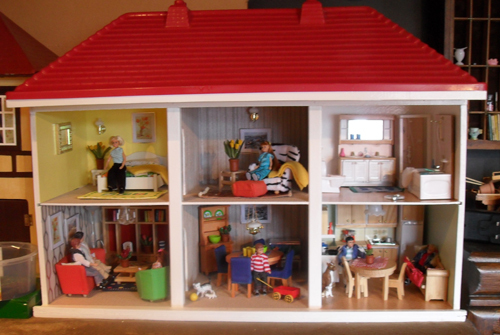 I have decided to put the Lundby furniture I bought into this house. It is quite modern furniture and I think it suits the house well. All the lights have been fitted and new plugs for other items that light up. 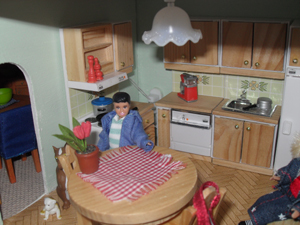 This is a lovely kitchen, with pine units, it has lights in the oven unit and in the oven. 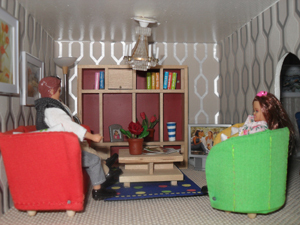 I hope these two young people are going to make Mum a nice cup of tea!There is a coffee machine and pots and pans. It also has a dishwasher and fridge. a very modern family kitchen. 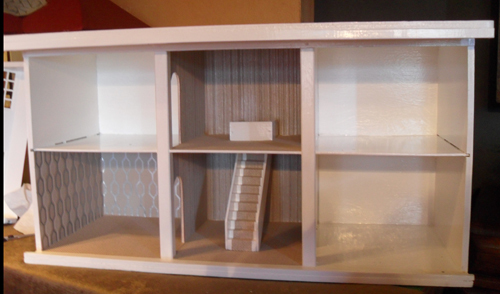 This furniture is such good quality with opening doors on all the cupboards. Mum looks quite happy relaxing in her pretty yellow bedroom. 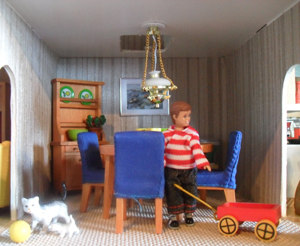 All the lights in the house are original Lundby lights, I managed to buy a new transformer, as it is a different voltage to the normal. The bathroom is very practical containing a bath and shower. The vanity unit lights up above the mirror and the double basins. 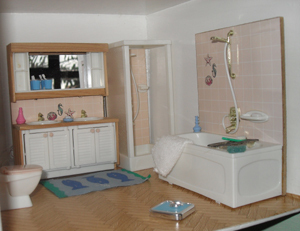 There are so many little details in the bathroom including toothbrushes, shampoo and towel. Time to rest on a lovely zebra style chair, and a place to rest your feet.